The late afternoon sun casts long shadows on the arches and balconies of Havana’s Spanish Colonial buildings. As I ride between them and the aqua-colored sea in a bright red, 1959 Cadillac Eldorado convertible, a breeze brushes my face. Nothing has changed much since the late 1950s. Sure, there are a couple of modern buildings and monuments but that’s about it. I feel like I am in a time warp. Cuba can do that to you. That sets it apart from other islands. So do Cuba’s “C’s” - like Castro, cigars, coffee and culture. Castro and Che (Guevera) fueled the 1953-59 revolution and made Cuba a communist country. Che (an M.D.) insisted on education. Today, the country boasts 97% literacy. Castro gave three-hour speeches at the foot of the 358-foot-tall star-shaped tower at the Plaza de la Revolución. A statue of the 19th century, anti-Spanish revolutionary, José Marti, sits near the bottom. Marti, Che and revolutionary guerrilla fighter Camilo Cienfuegos are etched on the sides of the surrounding modern buildings. Colonial Architectural is foremost during a stroll down the narrow streets of Habana Viejo (Old Havana). Many structures that house cafes and small hotels are freshly painted. Others are crumbling. One of Habana Viejo’s loveliest areas, the Plaza de la Catedral, is surrounded by old mansions and the late 18th century Catedral de la Habana. Note its imposing entrance and two towers. Plaza de Armas, once a drill field for colonial troops, is now lined with second-hand booksellers. The Nacional Hotel, built in 1930, speaks volumes of Cuba’s heyday. Its Salonida Historica features pictures of famous guests including Winston Churchill, Frank Sinatra, Rita Hayworth and more recently, Vladimir Putin. Bar Gallería is where I drank my first mojito and loved it. Ernest Hemingway preferred sipping Floritas here. Even if you have outgrown your thirst for Hemingway, visit Finca Vigia, his home from 1931 to 1961. A peek at his boat, stools from his favorite bar and writing room will conjure up memories of his novels. He wrote The Old Man and the Sea and For Whom the Bell Tolls in Cuba. The 1950s-style Tropicana is where guides always take visitors. Tacky but colorful, showgirls wear huge headpieces of feathers, flowers, fruit and even chandeliers. While a band plays energetic Cuban music, lights flash and performers dance on several different platforms. I preferred Café Ajiaco with its organic farm, mojito and cooking lessons, plus lunch. Everyone gets to do something in the kitchen. Some people fry beef and vegetables. I de-shelled a lobster tail, but a knife doesn’t work. So, the cook gave me an axe. Seasoned with cumin, oregano and fresh herbs, I cooked the destroyed crustacean with shrimp, vegetables, wine, tomato sauce. It becomes a fabulous feast. Most Cuban food is delicious, especially when accompanied by mojitos. Since this is a “people to people trip,” we visit the Casa Cultural Comunitaria in nearby Louton. This renovated water tank turned community center has artwork everywhere. Sculptures made from recycled metal and old cars abound. Murals and paintings are for sale. “Everything we do is to learn,” says Victor Rodriguez, head honcho at the center. And like all over Cuba, live music plays. A cute little 4-year-old comes and dances with everyone. 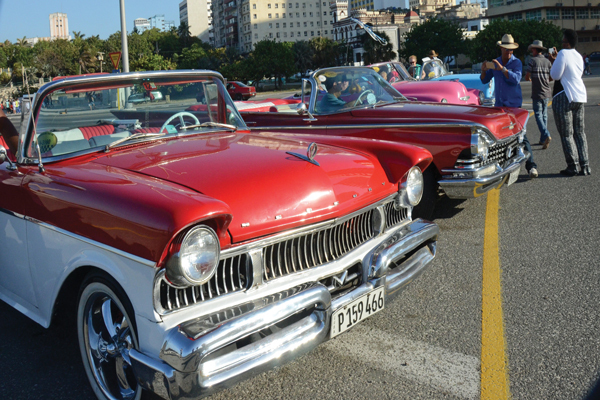 “Music is Cuba’s life,” says Cengiz Aras of Flo Tours (www.flotours.com). “It is used to show emotions,” adds our guide, Nadia.Gomez. Cuban rhythms follow us as we explore western Cuba’s Las Terrazas. Wandering amid hibiscus, mahogany and pines trees, a 75-foot waterfall and an orchid-enriched botanical garden in this UNESCO biosphere is pure joy. And says guide, Otis Campaign Melo, it has “the best coffeehouse in Cuba.” One of the 12 different coffees they offer is La Trerraza, a cold coffee with chocolate and rum. At the nearby Clave de Sol Music School young students treat us to a lively guitar concert. Then it is off to Matanzas Province, 62 miles east of Havana. Here, a 17th century fortress and former slave market houses the San Severino Museum. It focuses on slave history and the devotees of the Orishas brought by slaves from Africa, Briefly, this complex religion believes in destiny and a divine creator. Late afternoon is spent at the famous Varadero Beach where the sand is soft and the sea a deep sapphire. Cienfuegos is farther east. Settled by French immigrants, the port city’s most attractive building, Palacio de Valle, looks more like something you’d see in Spain’s Alhambra. One of town’s most delightful jewels is the Choir of Cienfuegos. The 20-person choir sings a cappella. Their sweet sounds are delightful. Trinidad is equally appealing. Founded in 1514 under a jagua tree in Plaza Mayor, the country’s most colonial city still boasts some its original buildings. Old sugar baron mansions surround the plaza. Palm trees, urns and marble benches are scattered within it. Locals gather here, making it the true heart of the little city. A small market sells tchotchkes, and Chi Chi Santandey Pottery offers unique pottery including colorful masks. Some of these are used in Afro-religious ceremonies. One of the most iconic things I saw on the way to lunch is a man hand rolling cigars. Cigars are probably the island’s most famous product. But, the smiling faces and energetic live music attracts me most. But visit Cuba soon. Planned development in the next five years could change its charm, as has happened to other Caribbean islands.